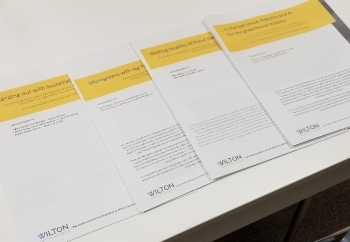 Both May and June have been busy months for the Wilton Consulting Group team as some of our team members attended events across Ontario and Quebec as a sort of “Innovation tour”. Starting at the beginning of May, we were at the SIAL Conference in Montreal. This international food and beverage trade show is key to Canada’s agri-food industry and showcases products and exhibits from over 850 companies representing more than 50 countries. Not only are there innovative and new products, but there are also networking and conference events. At one talk, we learned from Dana McCauley how failure fuels innovation. Highlights of the trade show include various juices, teas, and beverages, chia spread and nut butters, quinoas and grains, low cal/high protein convenient snacks, meals in a jar, cricket bars and crackers, and many more. As a company with a focus on sustainability, we were pleasantly surprised to see packaging technology showcased at this event and the use of EcoTensil, a sustainable and space-efficient spoon for sampling (an alternative to the traditional plastic versions). In addition to the expansive floor of vendors, there were also "Experts’ Hub” talks. We were particularly intrigued by the discussion about Clean Labelling by Jane Dummer and Carol Zweep as well as the Clean Meat talk with Jane Dummer, Dana McCauley, Daniel Clark, and Carol Zweep. 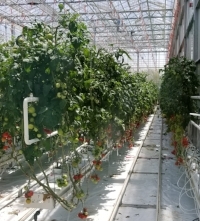 In mid-May we were able to tour Vineland’s greenhouse for their “Vineland’s Inside the Science: The Tomato Story” event. 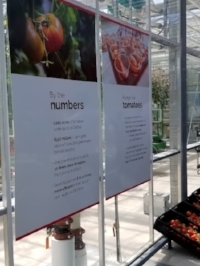 Vineland is currently breeding an Ontario greenhouse tomato on the vine (or 'TOV') that is ideal for our growing conditions. What is unique about this program is the consumer preference and market testing that has helped inform the breeding selection. The project is currently in its fifth year and guests at the event enjoyed, for the first time ever, one of the top TOV candidate varieties set for release in 2021. Not surprisingly, it was delicious! Finally, our team attended the Inaugural Arrell Food Summit at the end of May. We also helped develop and refine plain language case studies for the Summit. The case studies covered a range of topics across the agri-food sector and were well received by participants, academic authors, and conference organizers. Additionally, we enjoyed facilitating the breakout sessions where focused discussions were held based on the findings of each of the above case studies. During the event, we had the pleasure of hearing Dr. Roberta Bondar give a captivating keynote talk to kick off the first day. Topics and speakers ranged from food policy issues to food waste to blockchain to mental health in agriculture. Overall, the month of May was full of invigorating talks and networking covering all angles of the agri-food sector. Our industry is full of innovation and inspiring ideas and we look forward to future collaborations! Did you attend any of these events? What did you think? Share your thoughts in the comments below.